We can't think of anything negative to say about the JS Offshore. Grab your fishing gear – all of your fishing gear – put it on the Scout Offshore and you’ll be set for an entire day of offshore fishing. 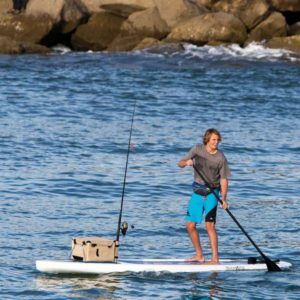 With the incredible carrying capacity of this board, you don’t need to leave anything behind. With its blown-out volume and width, you’ll be comfortably balanced in the rough open seas where all the best catches are. Think of this as the Cadillac of SUPs. It’s big, wide and turns like a 70ft yacht, and it glides through rough seas with a feeling of deep suspension. It has a polystyrene core with three layers of glass on the deck for handling the extra weight and two layers on the bottom. It reaches 12’6” and can carry up to 375lbs with its 295 liters of board volume. It weighs 33lbs and is 32” wide. It has a 5” nose rocker and 3” tail rocker. It comes in blue and white. And it comes with a planing hull, paddle, board bag, center fin and leash. 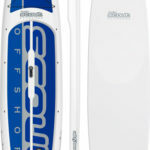 Fully designed and created for fishing out in open waters. It has increased rocker to help maneuver through rougher seas. It’s long and stable which makes hanging out on it all day easy and relaxing. Not for surfing heavy waves. Besides that, it does well if you want to skip the fishing and just go out for a paddle or go on a long-distance exploration. It will even be fun to surf on small point breaks and does well paddling into larger surf as long as it stays relatively flat. 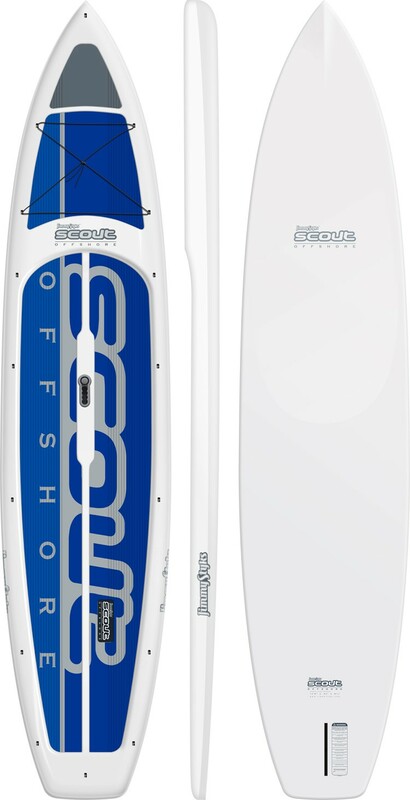 The ultimate SUP designed with fishing out at sea. It allows you to take all the gear you previously had to leave behind because of weight limitations. It’s very stable with a lot of room to get in a full day of fishing.